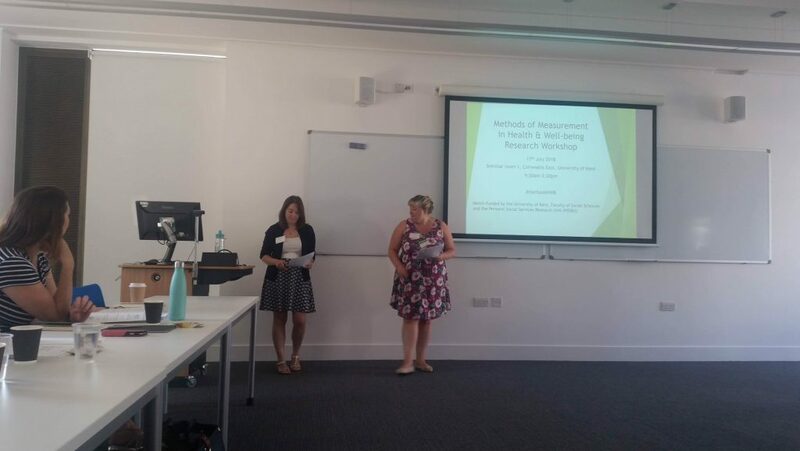 On Tuesday 17th July 2018, we hosted a workshop at the University of Kent entitled ‘Methods of Measurement in Health & Well-Being Research’ sponsored by the Faculty of Social Sciences – Matched Funding Grant and the Personal Social Services Research Unit (PSSRU). 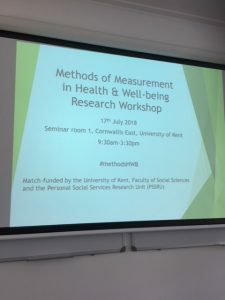 The aim of the workshop was to bring together researchers across the social sciences and from different universities to share and discuss the different methods of measurement used to assess health and well-being. We were excited to welcome delegates from all the schools across the Faculty of Social Sciences of University of Kent, as well as colleagues from the London School of Economics and Political Science (LSE) and academics visiting from Finland and Australia. During the first part of the workshop, six speakers presented the different approaches and methods used to measure health and well-being. The talks highlighted two key themes: 1) measurement methods in scale development- working with different populations, and 2) cutting-edge research methods. During the first theme, researchers Dr Roberta Fida (University of East Anglia), Dr Tom Page (Department of Psychology, University of Kent) and James Caiels (PSSRU, University of Kent) discussed measurement in hard-to-reach populations using self-report questionnaires. Dr Fida introduced the group to measuring moral disengagement and why some people act ‘unethically’ in the nursing context. Dr Page further presented work on the development of the C-DEMQOL – a new questionnaire used to measure quality of life in carers of people living with dementia. James Caiels described the development of the Easy-Read version of the Adult Social Care Outcomes Toolkit (ASCOT), which uses pictures and graphics to make it more accessible for people with intellectual and developmental disabilities. In the second theme, Dr Yanchun Bao (University of Essex), Dr Juliette Malley (PSSRU, LSE) and Dr Ciara Padden (Tizard Centre, University of Kent) shared cutting-edge research methods used to measure health and well-being. Dr Bao kicked off the theme by discussing her research on Mendelian randomization used to investigate the causal effects of BMI on well-being. Next up, Dr Malley presented work on measuring and valuing social care-related quality of life outcomes using ASCOT for use in economic evaluation. Dr Padden highlighted the benefits and challenges of using psychophysiological measures of stress in parents of children on the autism spectrum. The diverse programme stimulated much discussion after each presentation and throughout lunch. During the second half of the workshop, attendees took part in a short sandpit exercise. During the sandpit, attendees discussed and shared ideas on the theme of measurement in health and well-being research with individuals from different disciplines in small groups. This allowed everyone to get unique perspectives on the topic at large and to further establish multi-disciplinary and cross-institutional links, with the potential for future collaborations. As hosts, we helped facilitate the discussions by asking key questions, such as identifying basic definitions and concepts of ‘health’, ‘well-being’ and ‘measurement’. This led to in-depth debates and discussions on the benefits and challenges of measurement in health and well-being research. At the end of the event, attendees were invited to apply for a small research prize of up to £300 to fund a collaborative research activity related to measurement in health and well-being research (deadline 31st July 2018). We plan to inform successful applicants on the 14th August 2018. We followed up with attendees on their thoughts on the event by sending over a short feedback survey. Overall, the workshop was a success – the comments above reflecting this. The variety in speakers and interactive nature of the workshop allowed everyone to engage with different methods and measures used within the field and to meet individuals across different departments and universities. Given the positive feedback we received, we hope run a similar event in the future!